I was throwing out all the pins in my old pincushion to replace them with new ones and once the cushion was empty of pins I discovered where all my sewing needles had gone! It turns out I don't have a needle thief at all..... they had just slipped inside my pincushion. 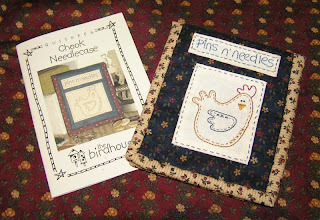 The little needlecase pattern is one by "The Birdhouse" and was given to me for my birthday a couple of years ago..... don't know why I didn't make it sooner (might of saved me some stress and my children some blame if I had)! Love the needle case, I made one recently out of wool felt. Not as cute as yours. Thanks for stopping by my blog and for the nice comments. Tried to email you a Thank you, but I noticed you don't have an email link. Nice needlecase you have made. A lot of my pins have rusted, so I have a jam jar at the ready, and any pin I use that has rust goes in the jar. I understand about the blood - I dropped my needle down between the couch cushions last night, and when I went to get it there certainly was blood!